I never tire of the brilliant color of a Male Western Tanager. We recently got to see a nice group of 5-6 males hanging out in trees of a thickly forested area. They were busy moving about foraging but luckily we did get a nice photo or two when they moved between the branches whereas the females although present remained quite hidden. HI and we also like Whitefish it is just about the right size to make one feel at ease these days. Thanks Jim, and yes there is always a bit of luck involved. 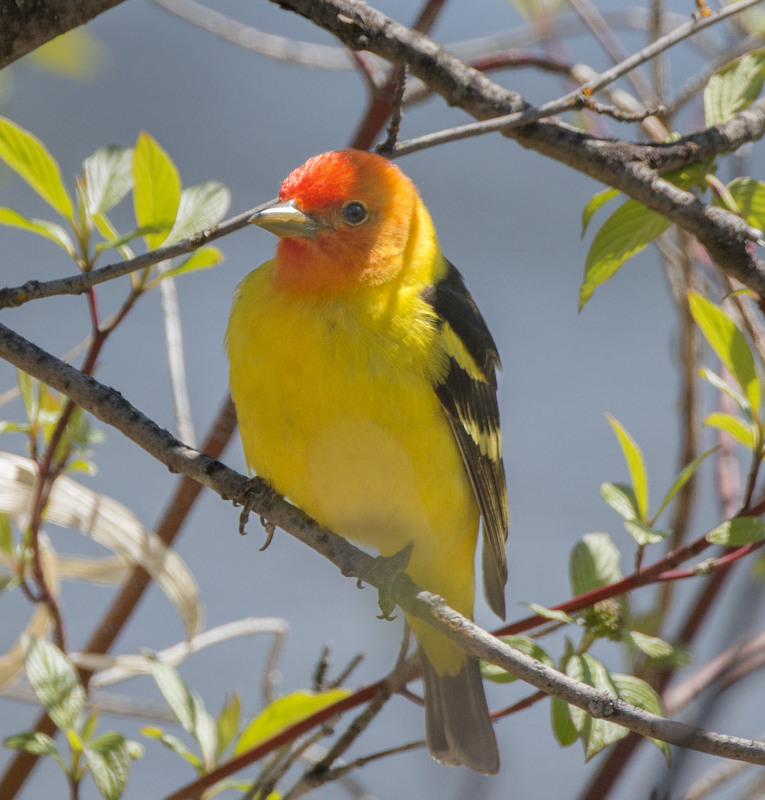 It’s always a special day when one comes across a male western tanager in breeding. And that you found more than one and got a great, crisp photo too — how very wonderful. Thanks Vicki, hope your day is going well. Brilliant indeed! Amazing shot Mike. Very nicely done. Thanks, hope you have a wonderful day. Thanks, it is always a treat when we get to see a fews of them while out and about. Gorgeous shot! I’d love to see one of them in my backyard!! Hi and yes that would be nice to have these guys visiting the yard as they could sure brighten up any ordinary day. I second that. Thanks for the feedback and taking time to leave it here on he blog. We really appreciate it. Hope you have a wonderful day. Handsome bird – wow, what color! He sure is and as an aside it is pretty amazing is that even a bird as brightly colored as this guy can blend into their surroundings so well you have a hard time seeing let alone photographing them. Hope you have a wonderful day. Masters of disguise. Hope tour week was wonderful. I like your blog – lovely photos and good snippets of thoughts and info. Thanks and thanks for the feedback as it is appreciated. The male Western Tanager is indeed a colorful gentleman isn’t he.